Despite the popularity of the USA's first ever black presidential candidate, as far as racism goes, it ain't over. Watch a black South Carolina TV reporter as she is attacked doing her stand-up. PANAMA CITY — President Bush strongly defended U.S. interrogation practices for detainees held in the war on terrorism Monday, insisting, "We do not torture." Are today's youth narcissistic, viewing themselves as entitled and 'special.? Yes, according to a recent study. The fault may be an over emphasis by parents and teachers on instilling self-esteem on naturally self-centered children. In their book about American demographic history Generations, authors Neil Howe and William Strauss propose New Silent Generation as the label for this generation. our incoming students are on some form of psychotropic medication." When Cheney rushed back to Washington from his dubious celebratory trip to Iraq following elections there the official reason given was so he would be available to break tie votes in Congress during the last minute push to pass controversial legislation before the holiday break. The one tied bill needing his vote was a budget item in which deep cuts were made in Medicaid/Medicare, student loans and food stamps. These cuts were necessary, claim opponents, in order to afford tax cuts for the rich a target audience for the beleaguered Bush administration. The wisdom of cutting programs for the low-income, poorest families remains a disturbing question. “When young school-age children do not always have enough to eat, their academic development -- especially reading – suffers. "We found that reading development, in particular, is affected in girls, though the mathematical skills of food-insecure children entering kindergarten also tend to develop significantly more slowly than other children's," said Edward Frongillo, associate professor of nutritional sciences at Cornell. The research provides the strongest evidence to date that food insecurity has specific developmental consequences for children. Food insecurity is defined as households having limited or uncertain availability of nutritionally adequate or safe foods. Despite federal food assistance and private charitable programs, food insecurity is a persistent national problem affecting 12 percent of all households and 18 percent of households with children. About one in five American children live in poverty, the highest level of childhood poverty among developed nations. The study is published in the December issue of the Journal of Nutrition (135:12). The History News Network at George Mason University has just polled historians informally on the Bush record. Four hundred and fifteen, about a third of those contacted, answered. These were the results: 338 said they believed Bush was failing, while 77 said he was succeeding. Fifty said they thought he was the worst president ever. The London Review of Books has an article about how the American right constructed a mythology around Jane Fonda in order to delegitimize opposition to the Vietnam war. the Nixon administration and its supporters engaged in a systematic campaign of misinformation to make Fonda and anti-war veterans into hate-figures. The urinal stickers would not be far behind. Every time Nixon ratcheted down the US commitment to the war, he launched an attack on the people who called on him to ratchet down the commitment. While the article doesn’t draw an explicit parallel with what’s happening today, it’s lurking just beneath the surface. The current efforts of various right wing propagandists to tar the anti-war left as traitors smack of Nixon’s smear campaign in the 1970’s. Then, as now, there was a widespread perception on left and right that the war was a disaster. Nonetheless, Nixon succeeded in using it as a wedge issue to split voters from the Democratic party, and to generate a set of pernicious myths that last to this day (not only Hanoi Jane’s treachery, but bogus stories about anti-war protesters spitting on veterans. One of the more bizarre items in the annals of contemporary American history is hysteria surrounding alleged Satanic sexual abuse of day care children in the notorious Los Angeles McMartin Pre School child molestation case. Now one of the "victims" has come forward to tell his story. Kyle Zirpolo is now 30 years old but is still troubled by the impact his false testimony had on the owners and employees of the school. Some 400 former McMartin children were interviewed and given genital exams, and many were diagnosed as abuse victims. This LA Times piece by Debbie Nathan includes a first-person account by Zirpolo who describes how his 'story' was extracted from him by professionals clearly victims themselves of mass hysteria and questionable professional judgment. Zirpolo also describes how his attempts at age 10 to confess his false statements to his mother were rejected and to this day his mother refuses to believe him when he says no one molested him despite having so testified in 1984. A revealing, and damning transcript of a small part of his testimony is reproduced in the article. Debbie Nathan was contacted by Zirpolo after he saw Capturing the Friedmans, a documentary in which she appeared, about a similar case of alleged child abuse on Long Island. The film is well worth viewing too. As Drudge and others noted yesterday Bush has been joking about his staff members' outing of Valerie Plame as an undercoverd CIA agent. The man just doesn't get it. Now comes speculation in Washington and elsewhere that Bush plans to pardon "Scooter" Libby if he is convicted of the crimes for which he was just indicted. The man just doesn't get it. 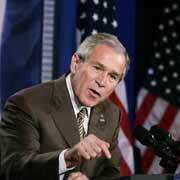 I wonder if he gets this: A new CBS poll shows Bush has an all time low approval rating of 35%.